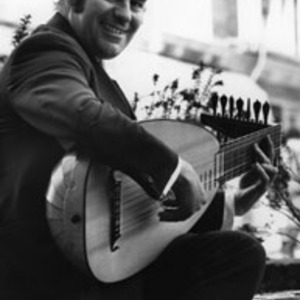 Julian Bream was born in London in 1933. He has been proclaimed by many students of classical music as the premier guitar and lute virtuoso of the 20th century. After studying piano, cello and composition at the Royal College of Music, he made his public debut in 1950, quickly winning fame for his technique and mastery of a wide range of musical styles. Bream's first London concert took place at the Wigmore Hall in 1951. Since then he has led the life of a busy and successful musician, dividing his time between his country, the recording studio, and concert hall. His musical tastes are varied and his fame as a lute player is as great as his reputation as a guitarist. His repertoire on the guitar ranges from the Bach Chaconne to works by contemporary composers. In 1960, he founded the Julian Bream Consort, an ensemble of original instrument virtuosi which enjoyed astounding success in their chosen oeuvre, greatly revitalizing interest in the music of the Elizabethan era.